Llamas could point the way to new ways of tackling human diseases, according to a Canadian-Belgian team. The animals produce antibodies which the company and researchers behind the work say could be used to treat conditions such as Alzheimer's disease. They say these "nanobodies" are smaller and more stable than human antibodies and may provide cheaper and more effective treatments. However, UK experts warned that the research was at a very early stage. A number of research teams around the world are investigating the potential benefits of antibody therapy. This research is being carried out by the National Research Council of Canada and the Belgian company Ablynx. Antibodies are complex protein molecules which attack foreign substances (antigens) in the body. 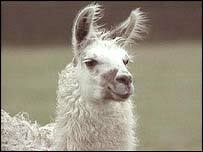 The researchers say animals in the camelid family, such as llamas, produce a much simpler type of antibody than humans. Because the animals' antibodies are much more simply constructed, they say, it is easier to take a small fragment which can then be used as a therapeutic treatment. The researchers say that the nanobodies' size - over 10 times smaller than a full-size human antibody - means they are better able to penetrate tissues. In addition, they say they are more stable than human complex antibodies because they have developed in animals which are exposed to extremely harsh conditions. Llamas are given antigens to trigger antibody production. The researchers can then identify which nanobodies bind to certain antigens. These nanobodies are then cultivated in larger numbers in bacteria in the laboratory. The Canadian team have used imaging techniques in the laboratory to show that a specific nanobody can cross the barrier between the blood system and the brain. This exists to prevent toxic substances getting into the brain, but can mean it is difficult to deliver medication. Dr Danica Stanimirovic, who led the research, said the next step would be to find a way to "piggyback" drugs into the brain. Ablynx is investigating other nanobodies which could be used in the treatment of neurological disease. The have carried out laboratory experiments which showed one nanobody binds to the protein which causes deposits, or plaques, to form in the brains of Alzheimer's patients. Simon Kerry, director of business development for the company, said animal experiments to begin to assess the potential therapeutic benefits were the next step. "We hope we will show that it is possible to disrupt plaque development, or formation." Clive Ballard, of the UK's Alzheimer's Society, said: "There has been a lot of interest in antibody approaches, and this new development might be something that will provide further opportunities to look at novel antibody therapies." But he added: "The researchers don't look at the potential immune response. That would be the concern."